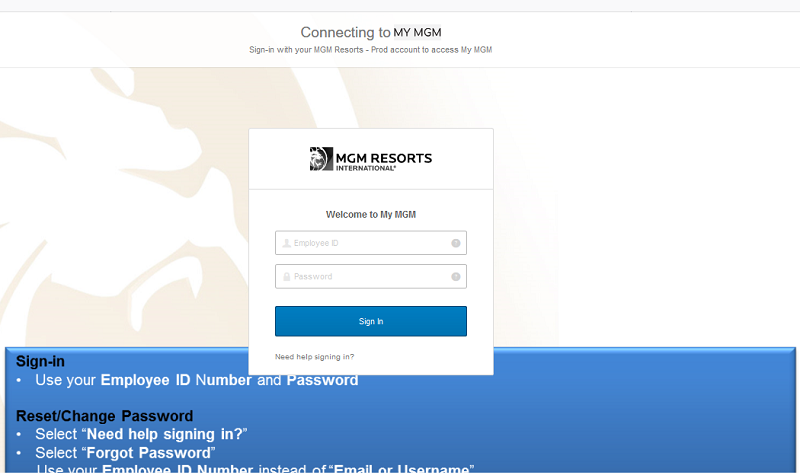 Login to your MGM Mlifeinsider.com account to view your work schedule, your payslips, book discounted hotel rooms, and more. Founded in 1986, MGM Resorts International is a global hospitality company, based in Las Vegas, Nevada, which operates a number of hotels, resorts and casinos. These include a large number of properties on the Las Vegas strip, as well as hotels and casinos throughout the United States and internationally. Mlifeinsider, meanwhile, is the internal employee web platform, where the company’s workers can log in and gain access to the MGM intranet, important business information and various employee benefits. It is connected to the M Life rewards scheme and can be accessed remotely by full-time employees. What Can I Use Mlifeinsider For? Mlifeinsider is available to current MGM Resorts employees only and so cannot be used by former employees or the general public. The platform can be used to access important work resources, such as information about pay and work benefits, as well as job openings at other properties owned or operated by MGM Resorts. In addition, Mlifeinsider provides employees with insider room rates, allowing them to book discounted rooms at MGM properties. These insider rates can also be shared with friends and family in some circumstances. How Do I Log In to My Mlifeinsider Account? First, make sure you are on the official M Life Insider login page. The login page can be found at www.mgmresorts.okta.com. Visiting www.MlifeInsider.com or www.MyMGM.com will also get you to this page, as MlifeInsider.com re-directs to www.mgmresorts.okta.com. To log in to Mlifeinsider, you need to have an Employee ID and password. These are obtained from local human resources departments, so if you are unsure of your login credentials, or if you are a new employee and have not yet received them, you should contact the HR department at your specific workplace. Once you have your login credentials, you can sign in by going to Mlifeinsider.com and entering your Employee ID and password in the fields provided. Then, simply click on the ‘Sign In’ button underneath. The official MLifeInsider login page will look like this screenshot. Enter your MGM Employee ID and Password. I Cannot Log In to My Mlifeinsider Account. What Could the Issue Be? From time to time, MGM Resorts employees may run into difficulties attempting to log in to their Mlifeinsider account. The first thing to check is that you have definitely entered your credentials correctly. You should pay particular attention to any potential typing errors and keep in mind that your password is case sensitive. If your login credentials are definitely correct, you could try clearing your cookies and browser data before trying again. Failing that, try using a different web browser, or a different device entirely. If you are still unable to gain access, you may need to reset your password, which can be done following the instructions below. I Have Forgotten My Mlifeinsider Password. On the next screen, you will need to enter your Employee ID. Then, select either ‘Reset via SMS’ or ‘Reset via Email’. Instructions outlining how to reset your password will then be sent to either the phone or email address you have associated with your account. Follow the prompts included to complete the process. How Can I Contact Mlifeinsider By Phone or Email? Should you need to contact Mlifeinsider for any reason, you can do so using the following information. Alternatively, if you would prefer to contact the support team via email, you can do so by going to Mlifeinsider.com. From there, click on ‘Need Help Signing In?’, followed by ‘Help’. Under the ‘More Help’ heading on the right-hand side, click ‘Send Feedback’ and follow the instructions to send a message. 2.1 What Can I Use Mlifeinsider For? 3.2 I Have Forgotten My Mlifeinsider Password.